This article presents a four-stage model for mentoring faculty in higher education to deliver high quality online instruction. It provides a timeline that shows the stages of program implementation. Known as the Distance Education Mentoring Program, its major outcomes include certified instructors, student achievement, and the attainment of a competitive advantage in the tight student market for higher education. The program's benefits to the mentor, protégé, and the organization are discussed. Barczyk, C., Buckenmeyer, J. & Feldman, L. (2010). Mentoring Professors: A Model for Developing Quality Online Instructors and Courses in Higher Education. 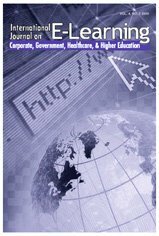 International Journal on E-Learning, 9 (1), 7-26. Waynesville, NC USA: Association for the Advancement of Computing in Education (AACE). Retrieved April 20, 2019 from https://www.learntechlib.org/primary/p/29273/. Allen, I.E., & Seaman, J. (2007). Online nation: Five years of growth in online learning. Sloan-C, available: http://www.sloan-C.org/publications/survey/pdf/online_nation.pdf Allen, I.E., & Seaman, J. (2005). Growing by degrees: Online education in the United States, 2005. Report of The Sloan Consortium of the Alfred P. Sloan Foundation. Bandura, A. (1986). Social foundations of thought and action, Englewood Cliffs, NJ: Prentice-Hall. Bell, C.R. (1998). Managers as mentors, San Francisco, CA: Barrett-Koehler. Boyer, Ernest L. (1990). Scholarship reconsidered: Priorities of the professoriate, Lawrenceville, NJ: Princeton University Press. Cunningham, S. (1999). The nature of workplace mentoring relationships among faculty members in Christian higher education. The Journal of Higher Education, 70, 441-463. Deming, W.E. (1986). Out of the crisis, Cambridge, MA: MIT Press. Dreher, G.F., & Ash, R.A. (1990). A comparative study of mentoring among men and women in managerial professional, and technical positions. Journal of Applied Psychology (75), 539-46. Fagan, M.M. (1986). Do formal mentoring programs really mentor?” In Proceedings of the First International Conference on Mentoring, Volume 2, Vancouver, B.C. : International Association for Mentoring. Florida Trend. (1992). TQM: You need it to survive. Florida trend. Hendricks, W. (1996). Coaching, mentoring, and managing, Franklin Lakes, NJ: Career Press. Knowles, M.S. (1980). The modern practice of adult education, New York: Cambridge, The Adult Education Company. Knowles, M.S. (1973). The adult learner: A neglected species, Houston: Gulf. Kram, K. (1985). Mentoring at work, Glenview, IL: Scott Foresman. LeCroy, N.A., & McClenney, K. (1992). To walk on water: Challenges for community college faculty, In Kroll, K. (Ed. ), Maintaining Faculty Excellence. New Directions for Community Colleges, No. 79, San Francisco: Jossey-Bass. Levinson, D. (1978). The seasons of a man’s life. New York: Balentine. Marx, S. (2005). Improving faculty use of technology in a small campus community. T.H.E. Journal 32(6), 21-23. Maslow, A.H. (1970). Motivation and personality, 2nd edition, New York: Harper& Row. Murray, M., & Owen, M.A. (1991). Beyond the myths and magic of mentoring: How to facilitate an effective mentoring program. San Francisco: Jossey-Bass. Odiorne, G.S. (1985). Mentoring– An American management innovation, personnel administrator, Alexandria, VA: American Society for Personnel Administration. Palmer, P.J. (1998). The courage to teach: Exploring the inner landscape of a teacher’s life, San Francisco, CA: Jossey-Bass. Penner, R. (2001). Mentoring in higher education. Direction, 30(1), 45-52. St. Clair, K.L. (1994). Faculty-to-faculty mentoring in the community college: An instructional component of faculty development. Community College Review, 22(3), 23-35. Seidman, E. (1985). In the words of faculty: Perspectives on improving teaching and educational quality in community colleges, San Francisco: Jossey-Bass. Weinstein, E. (1998). Mentoring for success. Des Moines, IA: American Media.